About 10,000 people have been evacuated from a scenic coastal town in South Africa that has been devastated by wildfires. 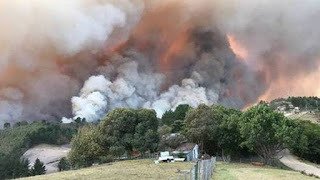 The Officials stated that Military equipment was being deployed to douse more than 25 fires in Knysna. At least eight people have been killed in the storms and fires that have been raging in the town and other areas of the Western Cape region. Strong winds from the worst winter storm in 30 years fuelled the fires. 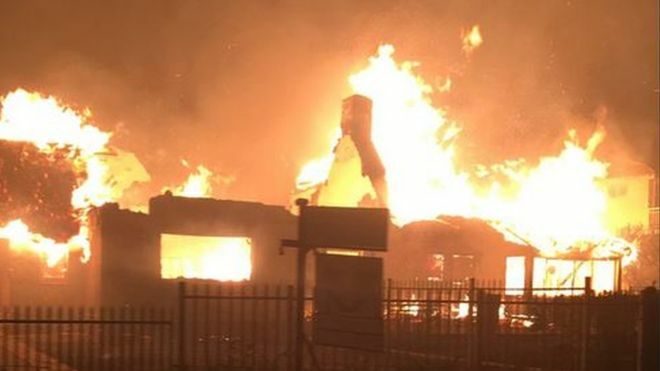 At least 150 properties have been destroyed in Knysna, according to the fire service. The town has a population of 77,000. It lies 500km (310 miles) east of Cape Town on South Africa's famed Garden Route. "Humanitarian support is being co-ordinated for an estimated 8,000 to 10,000 residents of the Greater Knysna area, after devastating fires," said James-Brent Styan, spokesman for the Western Cape local government ministry. The South African National Defence Force (SANDF) would assist in a water-bombing operation to extinguish the fires, its spokesman Simphiwe Dlamini said. About 150 troops would also be deployed to make sure that criminals do not loot properties that have been vacated, he added. In May, the Western Cape province declared a drought disaster after two reservoirs had completely dried up. It was said to have been the region's worst drought in more than a century. Several other southern African nations were also affected by the two-year drought, which was caused by the El Nino climate phenomenon. However, many parts of the region are now experiencing bumper maize harvests.